If you haven't checked out the "One World, Our Children" mural, created by artist Chinòn Maria and USA for UNHCR, the UN Refugee Agency and done via collaboration with Downtown Alliance, now is the time! 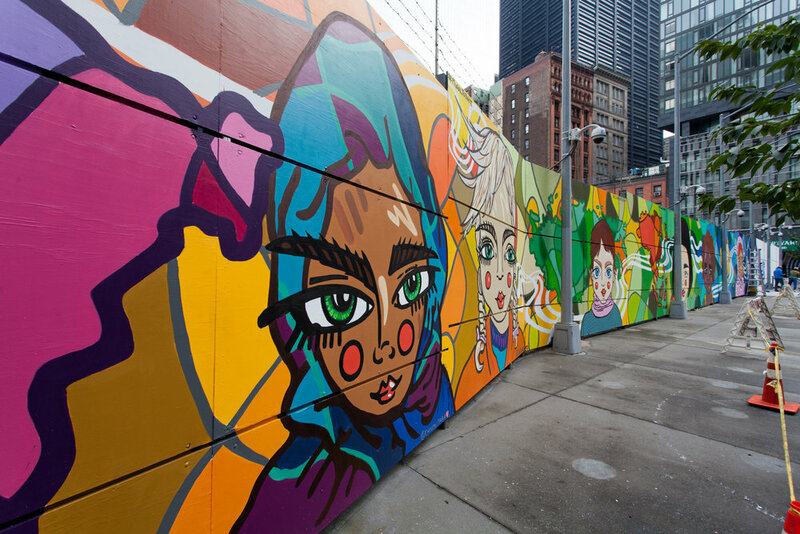 Located at Albany Plaza at the corner of Greenwich & Albany Streets, downtown NYC's new 200-ft-long mural was painted over the course of 4 weeks with 154 unique colors by street artist Chinòn Maria. The finished mural was inspired by the artist's work with USA for UNHCR, the UN Refugee Agency, and stands as a celebration of our cultural diversity. We spoke with Chinon Maria to learn more about the artist behind this incredible project. My name is Chinon Maria, I am an NYC artist who loves to paint large scale murals to help bring positive change to communities. How did you get involved with Downtown Alliance on this project? I first met Jessica Lapin at the opening for Tower To Streets at 4WTC, where my work was on display. We spoke at that point towards a possible collaboration for a public piece of art for the community that would also involve USA for UNHCR, the UN Refugee Agency and well, now the rest is history! What are you most excited about with this work? I believe I am most excited to see how the mural has already impacted the local community, and the joy, healing and excitement people had towards the project. What do you hope visitors take away from it? I hope it unites us together and makes our world feel more connected to each other through the language of art.